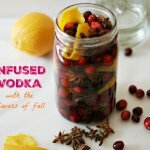 Enjoy the flavors of fall in the infused vodka using cranberries, oranges, cloves and star anise. A great low carb drink for fall. In a large mason jar, layer your ingredients except the vodka. Add your vodka last, seal and store in a cool dark area. Taste after a couple days and make adjustments if necessary. It should be done after a week or whenever it tastes best to you. Strain the vodka into a glass and refill the jar if you wish to make more. You can probably do this at least one more time to get another batch. Mix with orange juice, cranberry juice, seltzer water or sip over ice.